Lien Chieh Machinery (LCM) Hydraulic System provides the highest quality precise PCB Laminating Press in the world. All our products are designed and made with latest technology both pass through with international quality standards ISO 9001. We have established over thirty years that with high quality Customization got an excellent response from the market. At LCM, we is press and press maker who offer all kinds of hydraulic press including: Press Drawing Presses, Cold Press, Hot Press, Hot Forging Press, Forming Press, Metal Forming Press, High Speed Press, and Mechanical Press. 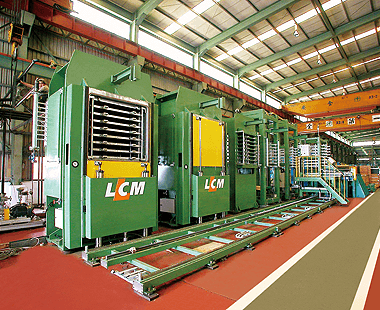 Since 1947, LCM has been specializing in producing PCB and CCL Laminating Hot Press. Our PCB Press Machinery has 8~36 openings CCL Laminating Vacuum Hot and Cold Press with automatic loading and unloading system, which help you to operate convenient and stable. Choosing LCM with high quality makes your future investment more secure. If you need a PCB Laminating Press or any about hydraulic press to improve your productivity, please just contact with our sales department.